Pop-up spaces are springing up like mushrooms after the rain. Both small and large-scale entrepreneurs are making use of this opportunity to promote their products in a targeted manner for a short period. Nomadic, dynamic and temporary, pop-up spaces are in vogue. For a long time, Berlin was a real-estate paradise with cheap rents. Many artists, gallery owners, curators and other cultural producers moved to the German capital to take advantage of the city’s large and inexpensive spaces. But these times have past, gentrification has arrived in Berlin as well: Urban districts are upgraded by conversion and renovations, rents are rising and more prosperous population displaces the original inhabitants. It is within this context that so called pop-up spaces, which are used for a certain length of time and for a variety of events, such as exotic food tastings or cooking courses, are currently arising. There are pop-up stores of young designers or fashion labels with one-of-a-kind articles, but also pop-up art galleries. Pop-up is thus primarily a new business model. Above all, it offers small businesses an opportunity to reach the public with their products and promote them. Self-promotion strategies look back on a long tradition in Berlin. As early as 1964 a group of sixteen painters founded the “self-help gallery” Großgörschen 35 in Berlin-Schöneberg. This producers’ gallery, organised by artists, housed exhibitions until 1968 and above all sought to present young art to the public. The involved artists took care of the rent and the organisation of the exhibitions, including press and PR, and was thereby able to save on further procurement costs. Since the mid-2000s, a number of new producers’ galleries were founded in Berlin-Mitte; in the Brunnenstraße and its neighbourhood – areas once known for buildings occupied by squatter movements and illegal celler pubs. Young artists, who wished to establish themselves on the market opened their own galleries. Some of them were even able, in addition to the gallery rent, to pay for their own gallerists. Interim use is a further form of self-promotion of cultural producers using temporarily vacant spaces. Generally, it is supported by government funds and managed by the city. Vacant commercial surfaces are activated, but also flats that are about to be renovated are made available to artists at a low cost. The artists frequently only pay the operating costs, while in the case of interim use agencies or district administrations take over the rent. This model is very widespread in Berlin, not only in the city centre, but also in outlying districts. An example is the project space JWD, which “has arisen in Hohenschönhausen as an interim workshop space for exhibitions, course offerings and other projects. JWD stands for ‘janz weit draußen,’ Berlin dialect for ‘peripheral suburb’”, thus Mario Margani, one of the project space’s co-founders. The artists’ group made innovative use of the site with a variety of events from January 2014 until March 2015. Here, making money was not the primary focus, but rather experimentation with the space and offering an art venue for the neighbouring community. The space of the housing association HOWOGE was offered to students of the Berlin-Weißensee School of Art and Design through a announcement. Essentially, the concept of “pop-up” just means an interim use that can last one day or several months. What is new is the business model, which particularly aims at enabling commercial purposes. There are even online offers that function in a way similar to virtual marketplaces for booking and renting accommodations. The pop-up concept is very widespread in other cities such as Hamburg. In 2015 the first pop-up festival, the “Lädenfestival popup,” was held in the district of Wilhelmsburg. Launched in 2013, the “Producers Art Fair P/ART,” is held each year at a different location. It facilitates direct contact between artists and collectors and frees the artists from both the institutional framework of a commercial gallery as well as dependency on its procurement channels. 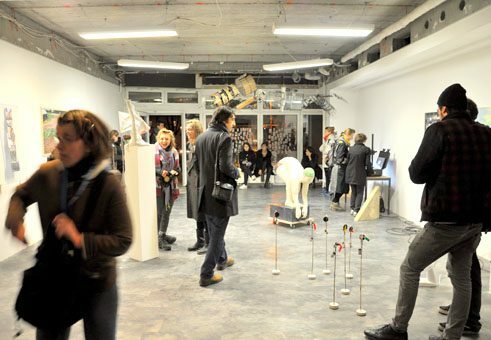 From April 2013 until June 2016, the “Hamburg Kreativ Gesellschaft”, an agency for the promotion of the creative economy initiated and founded by the municipality, is making pop-up spaces available at very inexpensive rents. For the vacant commercial spaces, so called actors in the creative economy have to go through an application process. They can then use the spaces from one to four weeks for 25,00 Euros per week. Back to Berlin. Here, spaces in need of renovation continue to be attractive as event venues. Damaged walls, protruding cables and pipes adorn the artworks of the pop-up gallery Shaping Clouds, which opened its first exhibition in Neukölln in March 2016. They can be seen for three months, then the space will finally be renovated. It will be interesting to see where this creative cloud will go next. Katerina Valdivia Bruch is a freelance curator, author and art critic. She lives and works in Berlin.